It’s been nearly eight years since Leica announced the M9, and in the meantime we've seen the M, the M-P, the M Monochrom and M-D. Now Leica is celebrating 10 years of its digital M series with the M10.. The Leica M10 features a new 24MP full-frame CMOS sensor – a significant step up from the 18MP sensor in the Leica M9. On top of the resolution bump, Leica claims users should see improved dynamic range and image quality on par to the Leica Q. Thanks to the new Maestro II image processor, Leica’s latest flagship camera supports ISO 100-50,000. Users can also capture images at 5fps for up to 30 RAW or 100 JPEG images at full resolution. 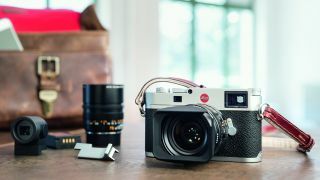 Unfortunately, the M10 offers no video features, but this is par for the course from Leica. The Leica M10 is one of the company’s smallest full-frame mirrorless cameras yet standing in at 660 grams (1.45 pounds) and 38.5mm (1.5-inches) thick. Compared to Leica’s more recent M Typ 240, this latest camera is 20 grams lighter and 3.5mm thinner. Leica has also improved the ergonomics of the M10 with a new dedicated ISO dial that goes from 100 to 6,400. The assemblage of rear buttons has been reduced to just three sitting beside the LCD screen and a four-way controller. The 0.73x viewfinder offers a 30% larger field of view than the previous 0.68x magnification seen on the Leica M9 and M Typ 240. The Leica M10 will be available starting tomorrow in limited quantities for $6,495 (about £5,290, AU$8,640).